Sometime ago, Gabriel (our youngest son) was in a play entitled, "Wizard of Oz: A Spiritual Interpretation". 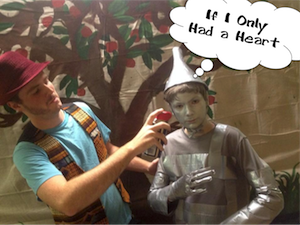 As the Tin Man, he was expected to perform a solo. Below are part of the lyrics. Of all our human body parts, the heart can be most like God or most unlike Him. Notice how the Holy Spirit describes the importance of the heart. "A good man brings good things out of the good stored up in his heart, and an evil man brings evil things out of the evil stored up in his heart." Clearly these three passages emphasize the importance of the heart for it is the well from which behavior flows. If parents want to change the behavior of their children they must first ask, "What is in my child's heart?" In Proverbs 4:23, the wise man illustrates the heart's importance by calling it a "well spring of life". But, to control behavior, we must go beyond just the discovery of what is in the heart. We must find out what is feeding the heart. What is the source of this "well spring"? What keeps it alive and fills it with purpose? Matthew 6:21 says, "For where your treasure is, there your heart will be also." The "treasure" is the source of the heart. Whatever is treasured fills the heart and from that fullness comes the behavior. Another word we might use for "treasure" is worship. This is the honor that is paid to someone or something that holds an all-consuming power over our attention. Unfortunately, it seems to be human nature to tempt God by worshipping things or beings other than Him. Our young people bow to peer pressure, idolize famous people and sacrifice their health and future for temporary highs. To save our youth, we must reconnect their hearts to the proper source. Two Primary Definitions of the Term "Worship"
2. "To be in awe of"
The second definition of worship is "to be in awe of". This definition goes beyond outward expressions and identifies the very reason for those expressions. Awe is what happens when you hold your newborn child for the first time or look up at the billions of stars in the sky. Awe causes an exhale of almost disbelief when confronted with how obviously awesome God truly is. Only when a heart is so filled with admiration and affection that words seem inadequate is it truly ready for sincere expressions of worship. Perhaps the reason young people are deserting the church in such alarming numbers is because the church is failing to encourage their awe. We offer them expressions of worship (to kiss toward) but fail to engage their hearts in experiences of worship (to be in awe). Many have wrongly concluded that the only way to remedy this situation is to make the worship service into a circus. Your author challenges that conclusion. I suggest that our young people are not asking for a circus, they are simply looking for conviction. Too often, young people watch adults go through motions without emotion and they ask themselves, "Why should I?" For a moment, allow me to be very personal. When was the last time you cried during communion or said "Amen!" after the final verse of "How Great Thou Art"? When was the last time you responded to the invitation and cried publicly about your sin? Conviction is not an option, it is a necessary condition of the heart that leads us into the presence of God. Our young people see too many grandfathers who do not sing during the song service or grandmothers who write their contribution checks while the grape juice is being passed. Too many fathers take time off from work to go on vacation, but refuse to take time off from work to go to church. Too many mothers are more concerned about their child's homework than they are about their child's assignments from Sunday school. Do you roast the preacher and grill the elders over Sunday lunch? Is church work your passion or something you endure? The young people are watching. They expect more than just empty words and heartless expressions. Before they give their lives to Jesus, they want to know how He has changed your life. Does it show? Are you convicted? Someone asked, "If you were on trial for being a Christian, would there be enough evidence to convict you?" Although this is a deeply probing question, perhaps a better question would be, "Since you are on trial for being a Christian, is there enough evidence to convict your children?" "These people honor me with their lips, but their hearts are far from me." (Matthew 15:8) Motions without emotions are not enough. To stop the tragic exodus of our young people from the church, we must help them find awe. We must make it real! Back to Top of "If I Only Had a Heart"